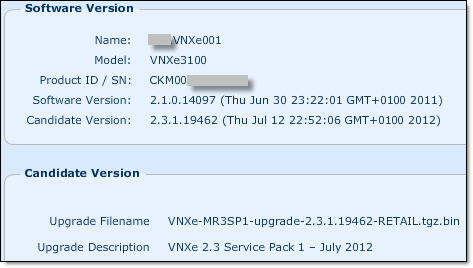 Click on Install Candidate Versionto update VNXe software. For VNXe arrays with a dual Storage Processor (SP) software upgrade is NON disruptive. Click Install. VNXe performs a health check to ensure that the update can occur. If the pre-update health check fails, you need to resolve the problem before performing the installation. After VNXe has finished installing the update, click Close. 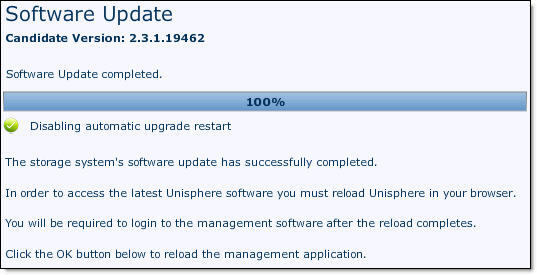 Re-open Unisphere and go through Post-Upgrade Configuration Wizard where you configure some setting which were not available in previous software version. Click the Disk Firmware tab. Click Obtain Disk Firmware Online. This link takes you to the EMC Online Support website where you can download a disk firmware file to your local system. Click Install Disk Firmware. A browse box opens. Click Browse and select the disk firmware file that you downloaded from EMC Online Support website. Click Upload. The disk firmware is uploaded to the VNXe storage system and installed on the system. I could not find any disk firmware upgrade packages for VNXe on EMC web site and logged a Service Request with EMC support. They confirmed that currently (October 2012) there is no disk firmware package available for VNXe disk firmware upgrade and they could not tell me when it is going to be available. They also confirmed that VNXe software upgrade does not contain any firmware upgrades for the disks.